> > I am arguing against looking at icc output as a gospel. > > IMHO, it means nothing at all. > output is suboptimal rather than the new core having some magic better-than-registers L0 cache. 1) The L0 cache is very complex. 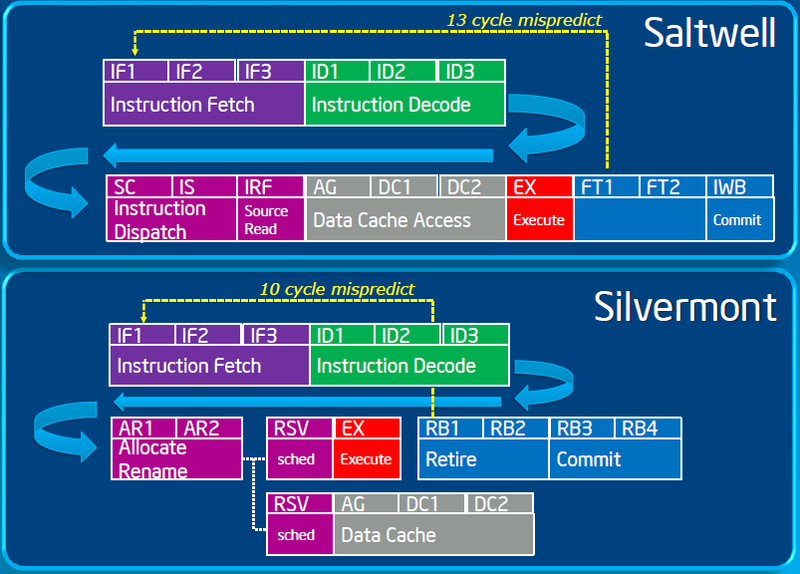 2) The Intel compiler is stupid. Firstly an L0 cache isn't complex. Only a few entries are needed and there's only ~20 bits worth of address encoding to test for a match (http://www.realworldtech.com/forum/?threadid=138897&curpostid=139072). Secondly it is one of the easiest optimizations to avoid reading memory operands multiple times. It has to be a deliberate choice (http://www.realworldtech.com/forum/?threadid=138897&curpostid=138966). So with those false assumptions out of the way, if we apply Occam's razor again then the existence of a simple L0 cache would fully explain what we're observing in Eric's code. Nicolas Capens (nicolas.capens.delete@this.gmail.com) on January 8, 2014 2:33 pm wrote: > Gabriele Svelto (gabriele.svelto.delete@this.gmail.com) on January 8, 2014 8:30 am wrote: > > Michael S (already5chosen.delete@this.yahoo.com) on January 8, 2014 1:42 am wrote: > > > I am arguing against looking at icc output as a gospel. > > > IMHO, it means nothing at all. > > > > I would say that in this situation Occam's razor suggests that it's far more likely that ICC's > > output is suboptimal rather than the new core having some magic better-than-registers L0 cache. > > Occam's razor is about making the fewest assumptions. You're making two assumptions: > 1) The L0 cache is very complex. > 2) The Intel compiler is stupid. > > Firstly an L0 cache isn't complex. Only a few entries are needed and there's only ~20 bits worth of address > encoding to test for a match (http://www.realworldtech.com/forum/?threadid=138897&curpostid=139072). Secondly > it is one of the easiest optimizations to avoid reading memory operands multiple times. It has to be a > deliberate choice (http://www.realworldtech.com/forum/?threadid=138897&curpostid=138966). > > So with those false assumptions out of the way, if we apply Occam's razor again then the > existence of a simple L0 cache would fully explain what we're observing in Eric's code.